Being the first ever skid steer series from Kubota®, the SSV Series revolutionized the skid steer market by combining Kubota's design ingenuity, and quality into a skid steer. Kubota's skid steer's have the widest cabs to date allowing the operator to pivot freely when checking there surroundings. The unique design of mounting the fuel tank on the rear door results in 26 gallons of volume removed from the engine compartment. The result of that extra space is an easy accessible engine compartment allowing for easy maintenance, daily checks and services. 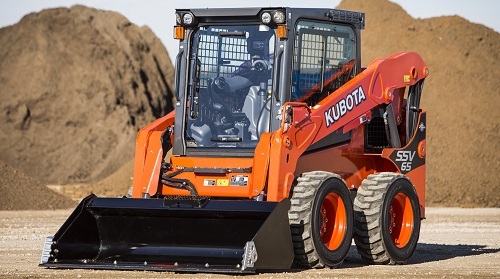 Borrowed from Kubota's compact track loaders, the proven loader arm design with vertical geometry can push and dig as good as a radial machine. Reinforced in all the right areas, this skid steer is designed for the toughest jobs. 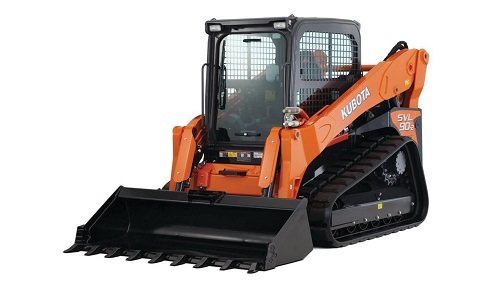 At the heart of the Kubota® skid steers is a Kubota® engine. Being the largest manufacturer of under - 100hp engines, Kubota® engines have proven there reliability and worth time and time again. 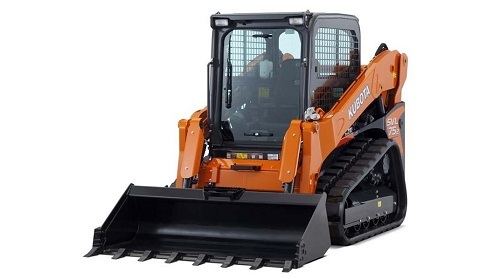 Some other skid steer manufactures have even taken advantage of Kubota's engine's reputation by using the platform in there own skid steers. 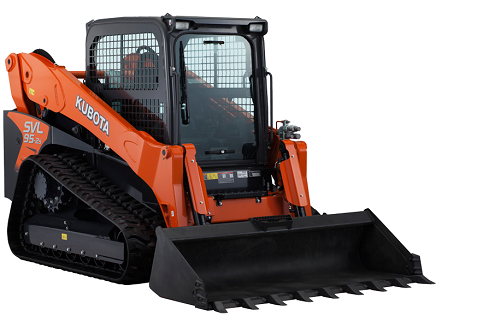 Below are specifications and technical information on the Kubota® SSV series skid steers. The SVL Series Kubota® skid steers feature a wide 36" side-screen to side-screen width allowing the operator to comfortably pivot when looking to the rear of the machine, in addition a high back seat provides back support from shoulders to lower torso. On models that are equipped with a cab enclosure, the cab door slides up and down to improve ingress and egress. Operators can pin the door in the open position and continue to operate with the door open, so there is no need to remove the door and store it where it can get lost or damaged. 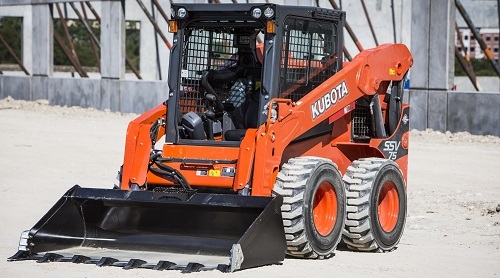 Because Kubota® designed there compact track loader first, Their design platform is unique compared to other track skid steers by having welded on undercarriages instead of bolt-on undercarriages to provide a sturdier and more durable design. 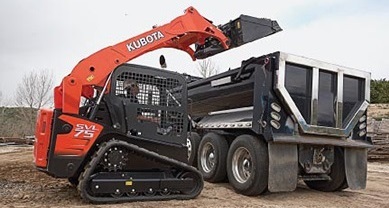 Shift from low to high gear with ease with Kubota's standard 2-speed travel and carry loads safer with the One-way hydraulic self-leveling, allowing the operator to keep the bucket in a horizontal position without the need to manually adjust the angle during lifting. Below are Kubota® skid steer measurements & technical specifications for the new SVL Series.